You are here: Home / Announcements / Severe Shortage of Natural Yellow Topaz | Fine Quality Topaz is more expensive than Entry Level Yellow Sapphire. Severe Shortage of Natural Yellow Topaz | Fine Quality Topaz is more expensive than Entry Level Yellow Sapphire. For the last 1 year the Gem that has proved to be elusive for Gemstoneuniverse- Take a Guess? Ruby Pearl Sapphire? 1) For a Gemstone to be effective for Astrological Purposes it has to be fully natural. This is the first parameter without any exception. Then it has to excel on other parameters that make it a true Jyotish Gemstone. We have examined several lots of Yellow Topaz from Brazil as well as Pakistan in the past 15 months but majority of these goods are treated by Radiation and hence rendered ineffective for Jyotish Purposes. 2) The Minority of the Goods that are radiation free do not touch the minimum Jyotish Quality clarity level of 85% and do not have a pleasing color and hence ineffective for Jyotish Purposes. 4) A Lot of Vendors are deliberately using the misnomer Golden Topaz and selling citrine. Citrine also known as Sunhela is not Yellow Topaz. A few vendors also state that High Quality Citrine is Yellow Topaz- This is an incorrect statement. 5) The Next Upratna for Yellow Sapphire is the Heliodor and it is going the same way as Natural yellow Topaz. So if you are looking for implementing Gem Therapy with Uparatnas then Heliodors is the way to go presently. We haven’t seen a Jyotish Quality Heliodor Lot since the last upload. 6) Unless new deposits are discovered the supply outlook of this Beautiful Gemstone looks bleak. You can look at entry level yellow Sapphires or Heliodors and implement Planetary Gem Therapy. We stand by our commitment to Planetary Gemology and our patrons. In no which way we shall upload goods that are not Jyotish Quality. For now the situation is bleak and if there are any improvements we shall keep you posted…. 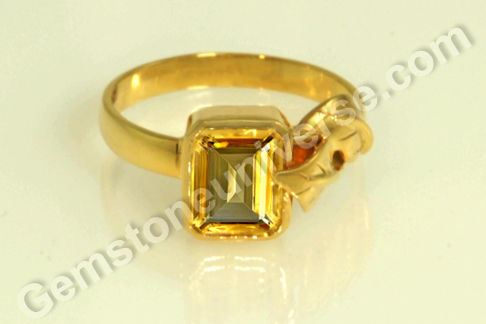 It’s true, untreated flawless yellow topaz has gone up in value and is difficult to source. Many are selling citrine and calling it pukraj. This is fraudulent. However, fine quality unheated yellow sapphire of eye flawless clarity and good color and symmetry are much more costly than yellow topaz.